This will be the 18th consecutive weekly Sunday Mass here at St. Dominic’s. Since the beginning of May, there hasn’t been a single Sunday without a Mass here! Talk about reliability and commitment. Thank you, Fr. 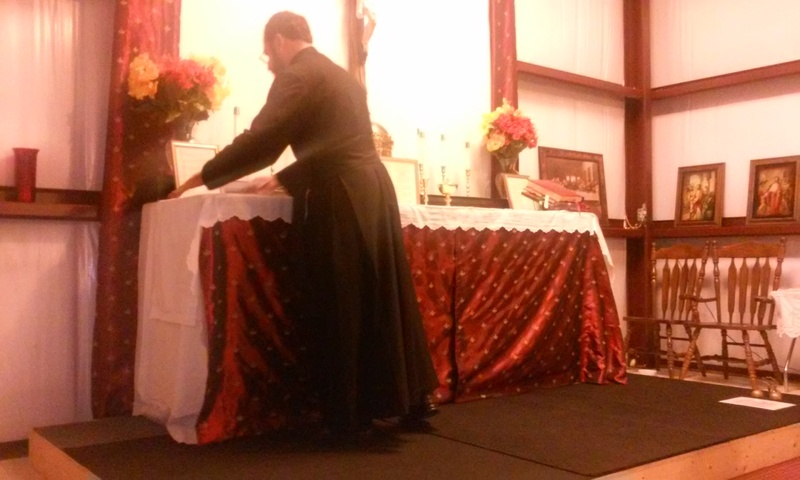 Gerardo Zendejas and Fr. Adrian Garcia! High Mass Next Week – Next Sunday, Sept. 6th, is the 1st Sunday of the month, so we will have a High Mass, as well as our monthly Potluck after Mass. Hope to see you there! Catechism Classes – We will start Catechism classes in two weeks, on September 13th. There will be two classes for the children. Catechism classes will run from 2:30 to 3:15 each Sunday before Mass. Pews Installed – St. Dominic’s Chapel was blessed to receive 12 beautiful pews, each are eleven feet long, solid oak with padded kneelers! They are in good condition, and we are quite happy to have them in the chapel for the past few weeks. It really feels like a Latin Mass chapel now! 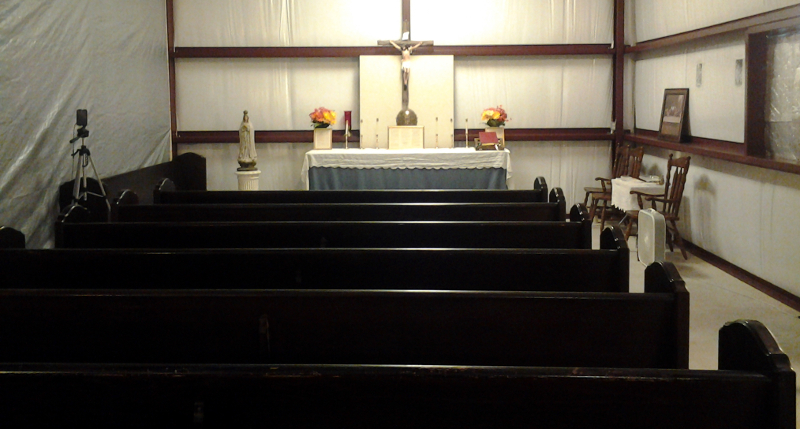 After all, these are real Catholic pews, just like you have seen in countless churches before. They are a dark walnut color and have a very traditional style. Deo Gratias, some Catholic church somewhere was willing to part with them. Donations to help cover this expense can be placed in the Donations can by the main entrance. The pews had to be transported from Houston, TX, which was an all-day project, as Houston is quite a drive (about 240 miles). San Antonio and Austin are right next door compared to how far away Houston is! Mass Time Change – From now on, Mass every Sunday will be at 4:00 PM to allow the Fathers more travel time to drive here from Houston. Sunday afternoon traffic was making it difficult for them to get here by the old Mass time (2:30). Of course, a lot of those people clogging up the road weren’t going to church, but that’s another issue. 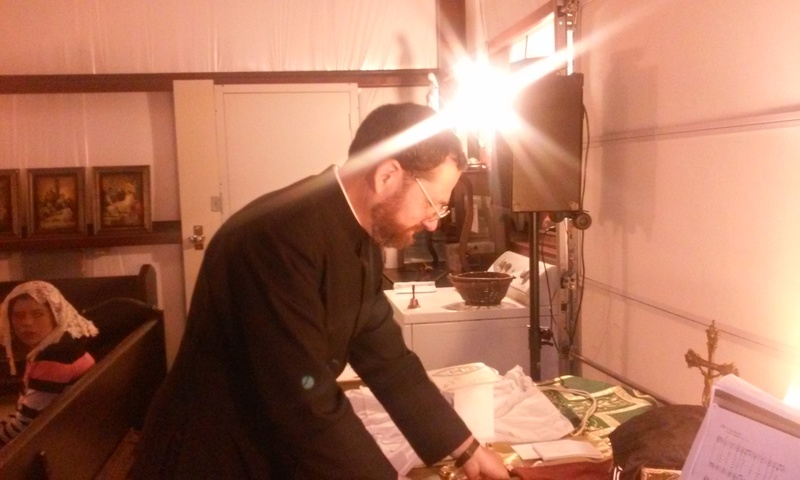 Father is also changing the Sunday Mass time at Stella Maris Chapel in Houston to be 1 hour later, so more parishioners can make the long drive to church on time, every Sunday morning. This entry was posted in San Antonio chapel and tagged 1962 Missal, bulletin, chapel, church, churches, houston, independent chapel, latin mass, San Antonio, Seguin, sunday, Traditional Latin Mass, Vatican 2 Resistance on August 28, 2015 by sudoku-for-android. Last week had enough big news, but we have some more extraordinary news this week — St. Dominic’s Chapel now has proper Catholic pews, just like every church or chapel you’ve ever been in! 12 of them to be exact. And don’t forget we’re having Mass here at 10:00 AM next Saturday, on August 15th. Pews Installed – St. Dominic’s Chapel was able to acquire (12) eleven-foot, solid oak pews with padded kneelers! They have been installed in the chapel, which has never looked better! It’s really starting to look like a proper Latin Mass chapel now. 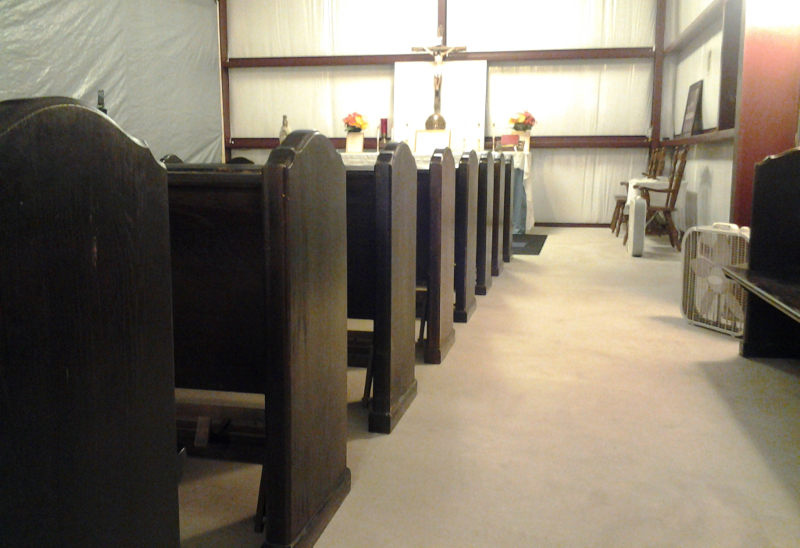 The pews are a dark brown color and very traditional in their design. These are typical pews with kneelers, just as you’ve seen in all the churches you’ve ever been in. Donations to help cover this cost can be placed in the Donations can by the main door. They had to be picked up in Houston, TX about 240 miles away. It was quite a drive, as Houston is quite a bit further away than Austin, San Marcos or one of the many other cities it’s easy to get to from here. 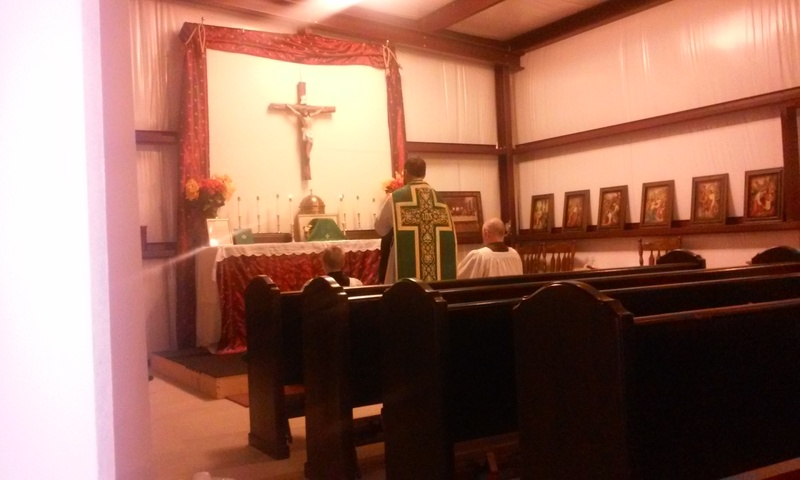 Normally San Antonio is pretty independent of Houston, but in the world of Traditional Latin Mass chapels, we are going to be very involved with Houston for the forseeable future! Transporting these pews to the chapel was a much bigger deal than ordering a 1962 Missal, thurible, or incense boat (which is shipped right to you) — but to make St. Dominic’s seem more like a proper church, it was well worth it! Churches are expected to have pews. Holy Day this Saturday – Mass on August 15th, the Feast of the Assumption of the Blessed Virgin Mary, will be at 10:00 AM. Mass Time Change – After today, Sunday Mass time will change to 4:00 PM to allow Father more time to travel here from Houston. Sunday morning traffic made it difficult for him to get here at 2:30. Plus he is changing the Mass time in Houston to be 1 hour later. Sometimes travel between the two churches is difficult, due to weekend or daytime traffic. 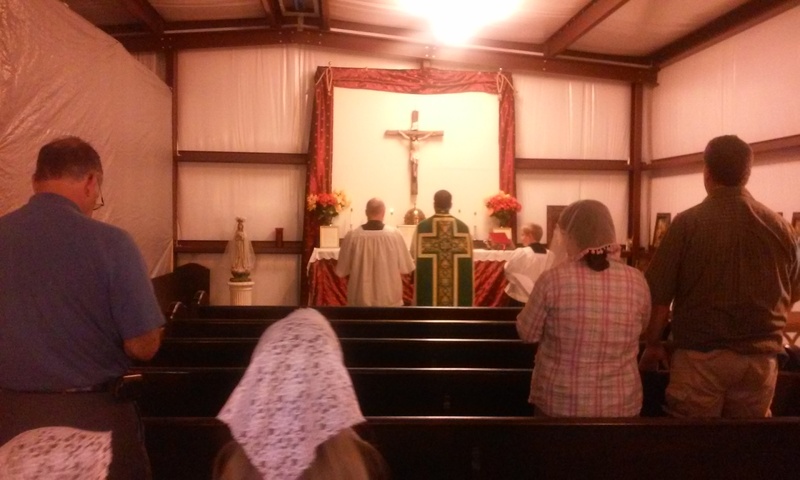 Stella Maris Chapel – For those curious about how things are going at our neighboring chapel in Houston: As of August 2nd, the new chapel property outside Houston is being used for Mass for the group of traditional Catholics there. The priests’ residence or rectory on the property was also vacated by the previous owners about this time (there was some resistance on the part of the renters to move out, but they did move out during the 30 day timeframe). Currently, work on the refurbishing the various buildings (including the chapel, rectory and school) is proceeding at a fast pace. This is great news for the Church in south-central Texas. This entry was posted in San Antonio chapel and tagged 1962 Missal, Assumption, bulletin, chapel, church, churches, equipment, holy day, improvements, pews, San Antonio, Seguin, sunday, Traditional Latin Mass, upgrades on August 6, 2015 by sudoku-for-android.